The traditional base of freshly plastered mud wall of huts has now been replaced by cloth, handmade paper and canvas. Since the paintings have been confined to a limited geographical range, the themes as well as the style are, more or less, the same. Indian Maithili paintings make use of three-dimensional images and the colors that are used are derived mainly from plants. The themes on which these paintings are based include nature and mythological events. The first reference to the Maithili painting of Bihar dates back to the time of Ramayana, when King Janaka ordered the paintings to be created for his daughter, Sita's, wedding. 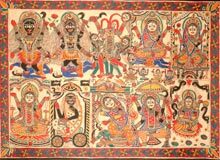 Themes of the Maithili painting of Bihar revolve around Hindu deities like Krishna, Rama, Lakshmi, Shiva, Durga and Saraswati. The natural themes that are used include the Sun, the Moon and the religious plants like tulsi. One can also find paintings based on scenes from the royal courts and social events, like weddings. If any empty space is left after painting the main theme, it is filled up with the motifs of flowers, animals and birds or geometric designs. The brush used for Madhubani paintings of Bihar was made of cotton, wrapped around a bamboo stick. The artists prepare the colors that are used for the paintings. Black color is made by adding soot to cow dung; yellow from combining turmeric (or pollen or lime) with the milk of banyan leaves; blue from indigo; red from the kusam flower juice or red sandalwood; green from the leaves of the wood apple tree; white from rice powder and orange from palasha flowers. There is no shading in the application of colors. A double line is drawn for outlines and the gap is filled with either cross or straight tiny lines. The linear Maithili paintings do not even require application of colors; only the outlines are drawn.